Opposition Maldivian Democratic Party (MDP) leader and former President Mohamed Nasheed has predicted that he will be jailed in the upcoming weeks. Speaking at the party’s 129th National Council sitting last night (February 10) Nasheed stated that although he will be very saddened to leave his family and worldly pleasures, he is determined to patiently bear the pain and “if necessary, even torture”. “Nevertheless, with your permission, I would like to spend my jail days as the president of this party”, Nasheed said, requesting that the party “try and free me as soon as possible” and to “try and find a way in which I could be saved without being sentenced”. Nasheed’s challenge of the composition of the Hulhumalé Magistrates Court bench was rejected on jurisdictional grounds on Monday (February 9), paving the way for the court to resume his trial for the January 2012 detention of Criminal Court Judge Abdulla Mohamed. Nasheed has described judicial proceedings as being influenced by the government, making them “unfair”, alleging that the government’s intention was to sentence him before the new Penal Code is implemented in April, 2015. Nasheed’s legal team has subsequently submitted the case to the Civil Court, again challenging the composition of the Hulhumalé court bench. The first hearing of the case is scheduled at Civil Court today at 4pm. In last night’s meeting held to discuss the steps that need to be taken by the MDP in defending the Constitution, Nasheed also said that more than 10 parliament members from the ruling Progressive Party of Maldives (PPM) are discussing switching to the opposition alliance. The MDP and Gasim Ibrahim’s Jumhooree Party (JP) signed an agreement during a mass rally last Thursday (February 5) night to “defend the spirit of the Constitution and do everything necessary to guarantee the rule of law”. The agreement pledges to prevent the passing of any propositions in the People’s Majlis against the letter or the spirit of the Constitution, both inside and outside of the Majlis. Currently, the two parties control 34 seats in the 85-seat legislature. The MDP National Council also decided last night to pass a motion submitted by Villimalé constituency president Mohamed Ibrahim Manik to lift the disciplinary measures preventing MPs who had violated the party’s whip line from participating in votes taken in the party’s internal bodies. It was also decided that Anas Abdul Sattar be appointed as the party’s secretary general. Nasheed stated that the joint parliamentary group to be formed under the MDP-JP agreement will strive towards appointing Maamigili MP Gasim to post of speaker of parliament. Gasim’s decision to stand for the position last May prompted the end of his party’s alliance with the PPM, though the JP did not officially sever ties until late last month. Nasheed also assured that, if and when the alliance gains the majority, the current composition of independent institutions, such as the Judicial Services Commission, will be changed. “I will be even more active from block C of Maafushi Jail,” concluded Nasheed. A panel of High Court judges have overruled a decision by the court’s registrar to reject a case filed by a losing candidate seeking annulment of the results for the Feydhoo constituency in the March 22 parliamentary polls. The registrar’s decision regarding the Feydhoo constituency was overturned after the claimant – opposition Maldivian Democratic Party (MDP) candidate Mohamed Nihad – appealed the decision. Of the 16 election-related complaints submitted to the High Court before the deadline last Friday (April 11), the court has rejected three cases and commenced proceedings on 12 others. Following the decision to accept Nihad’s complaint, a first hearing of the Feydhoo constituency case has been scheduled for 2:15pm tomorrow (April 17). Electoral laws stipulate that the High Court must conclude election-related cases within 30 days of the announcement of the official results, which was made on March 28. In addition to complaints submitted by its candidates, the main opposition party has challenged the results in three constituencies. Briefing members of the MDP’s national council yesterday, former Human Resources Minister Hassan Latheef – a member of the party’s legal committee – explained that that the party filed cases concerning the Villigili, Isdhoo, and Gemanafushi constituencies. As both the constitution and electoral laws stipulate that voting must be conducted through secret ballot, Latheef said the Elections Commission (EC) was responsible for ensuring secrecy of the ballot. Based on precedents established by the High Court and Supreme Court, Latheef explained that the MDP has asked the High Court to declare that ballot papers tagged with a symbol or mark would be invalid. In the Gaaf Alif Villigili constituency election, Latheef said that about 300 ballot papers were tagged, all of which were counted as valid votes for the Progressive Party of Maldives’ (PPM) candidate. Similarly, in the Laamu Isdhoo constituency, Latheef said the number of tagged ballot papers was more than 150 while there were more than 100 tagged ballot papers in the Gemanafushi constituency. Latheef noted that in all three constituencies, the margin between MDP and PPM candidates was smaller than the number of tagged ballot papers identified by observers. The party has submitted witnesses in all three cases, he said. Under a precedent established by a Supreme Court ruling, Latheef said that if the number of ballots whose secrecy was compromised exceeds the margin of victory, the poll would not be valid. As compromising the secrecy of the ballot in any election was illegal, Latheef contended that tagged ballot papers should be considered invalid votes. Hearings have nearly concluded in all three cases, Latheef continued, and judges have said that verdicts would be delivered at the next trial date if they decide not to summon witnesses. Following Latheef’s briefing and presentation of the legal committee’s report on the election-related cases, former President Mohamed Nasheed – who was chairing yesterday’s national council meeting following his appointment as the party’s acting president – said that the party’s secretariat requested information of suspected wrongdoing from all election observers. Detailed information was sent to the party office by MDP observers in the three constituencies where the party has challenged the results, he noted. “Our biggest aim is to ensure that votes taken in the Maldives in the future are valid, transparent, and trustworthy,” Nasheed said. Earlier this month, the MDP issued a press release accusing government-aligned parties of unduly influencing the March 22 polls through coercion and intimidation in addition to vote buying. Some voters were asked to tag their ballot papers with a special mark or symbol for PPM observers and candidate representatives to identify their votes, the party alleged. Voters were threatened with dismissal from their government jobs if they did not follow the instructions and proved they voted for the coalition candidate, the press release stated. In the wake of the Majlis elections, NGO Transparency Maldives stated that while the polls were well-administered and transparent, “wider issues of money politics threatens to hijack the democratic process”. The religious conservative Adhaalath Party also blamed its poor showing on bribery and coercion – accusing both sides of such practices. “We saw it both from the ruling party and opposition Maldivian Democratic Party but we really did not want to buy votes – instead we tried to change the way people think,’’ Adhaalath Party Spokesperson Ali Zahir told Minivan News. The Maldivian Democratic Party (MDP) National Council passed a motion on Monday agreeing to “do everything it takes” to bring down the “coup regime” of President Mohamed Waheed Hassan, by “all necessary means and sacrifices”. The motion was proposed by the former chairperson of the National Social Protection Agency (NSPA), MDP constituency president of Haa Dhaal Nolhivaram constituency Ibrahim Waheed, and seconded by MDP MP Ahmed Sameer. The motion stated that the initial three member panel of the Commission of National Inquiry (CNI), which President Waheed formed to investigate the controversial transfer of power on February 7, had failed to include several “key facts” in its timeline. Despite the absence of these facts, the timeline revealed the transfer was a coup d’état, the MDP stated. It also stated that the report composed by Mohamed Aslam and Ameen Faisal revealed that the government of MDP was toppled illegitimately, and alleged that the perpetrators of the coup had planned to harm President Nasheed. The motion further stated that current President Mohamed Waheed Hassan had played a pivotal role in the coup, self-proclaiming certain powers which President Nasheed had not delegated to him as per article 117 (a) of the constitution. The motion concluded stating that the National Council believed that necessary action needed to be taken to bring down the illegitimate government by all means and any sacrifices needed in the process, until a legitimate people’s government was installed in the country. 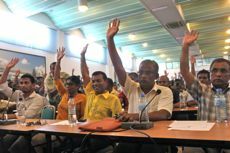 During the debate over the motion, several members of the national council claimed that President Waheed had come to power in a coup d’état, and the party should do whatever it took to bring down the regime and install a democratic government. 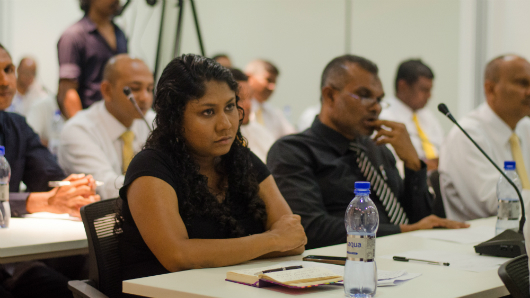 Members of the national council expressed concern over recurrent police brutality, and claimed that this had increased to such an extent that some police and MNDF officers had begun openly robbing people on the street. Speaking in the debate, ousted President Mohamed Nasheed said that despite the MDP refusing to recognise the initial composition of the CNI, the latest timeline released by the initial three member panel of CNI also implied that it was a coup. Former MP for Thimarafushi Constituency, Mohamed Musthafa, said during the debate that the party must be willing to make sacrifices to ensure that the “legitimate” MDP government was reinstated, and the democracy was reestablished. “Coming out on the street once a week to show our hands and dance about and then go home is not a solution. We need a solution by any means possible,” he said. He further said that the MDP should not be scared if sacrifice also meant going to prison. During the vote for the motion, the motion was passed unanimously by the 55 attending members of the National Council. Earlier, fresh protests erupted following a MDP National Council meeting held right next to the police barricades near the swimming tracks after police raided the MDP’s protest camp Usfasgandu. The clustered meeting of 43 members of the council took the stand that “enough was enough” and that party should take to the streets to get their constitutional rights. 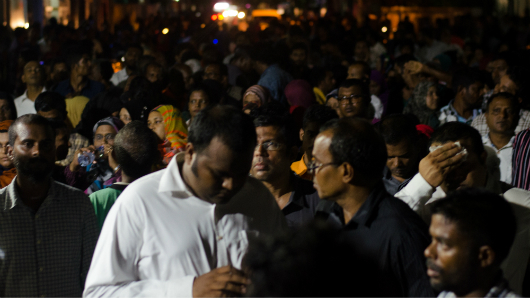 Immediately, 400 protesters gathered in the area to challenge the legitimacy of police and demand the return of Usfasgandu, saying that they had not done anything violent. The protests triggered a brutal police crackdown leading to arrests and injuries. Speaking to Minivan News, MDP Spokesperson Hamid Abdul Ghafoor said that the purpose of the motion meant that the party would stand firm and strong to defend the public rights. “The National Council’s decision will be forwarded to a committee within the National Council, and they would decide how the party would act upon the motion. What I know is that we will stand strong to defend the public rights,” he said. He also added that it was a part of party’s ongoing rally under the name of ‘Insaafuge Dhathuru’, translated as Journey to Justice, which began on February 17, just ten days after the MDP government was ousted. “I call upon Dr Waheed to immediately step down from the seat he is sitting in and call for immediate elections,” said former President Mohamed Nasheed during a Maldivian Democratic Party (MDP) National Council meeting at Dharubaruge this afternoon. The council further rejected the now-forming national unity government’s invitation to join forces, and declaring Nasheed’s former government the only “legitimate” government said it would not negotiate with the opposing ruling body. Nasheed spoke to hundreds of party supporters packed into the entire top floor of Dharubaruge, along with the sitting members of the national council. MP ‘Reeko’ Moosa Manik chaired the meeting. According to MDP, Nasheed was yesterday forced to resign by the military, which forced the state broadcasting station MNBC to revert to its identity Television Maldives (TVM) and threatened “a bloodbath in the capital” if Nasheed did not step down from the presidency. The alleged coup arose out of three weeks of opposition-led protests calling for the release of Criminal Court Chief Judge Abdulla Mohamed who was arrested on January 16 after attempting to block his own police summons. Protesters declared the arrest a violation of human rights while members of former president Maumoon Abdul Gayoom’s opposition Progressive Party of the Maldives (PPM) accused Nasheed of acting unlawfully. Following an all-night protest on February 6, under 100 police officers defected from their position as state security and assisted protesters in an attack on the then-ruling MDP camp, triggering a larger clash between police and Maldives National Defense Forces (MNDF) last morning which left many injured. Following Nasheed’s resignation at 1:00 pm, former Vice President Dr Mohamed Waheed Hassan was sworn into office yesterday at 3:00pm with the support of several opposition parties. He said he intends to fulfill Nasheed’s term until the scheduled presidential elections in 2013. Meanwhile, members of Nasheed’s government have said they did not attend work today and are awaiting political appointment. Gathering for the council meeting today at Dharubaruge, throngs of MDP supporters and members of the former government chanted for Nasheed upon his arrival, filling the building’s top floor and screaming in support as sitting council members declared resistance to Dr Waheed’s national unity government. Speaking from atop her chair at the front of the council MP Mariya Ahmed Didi declared yesterday’s events a coup and called on the council to accept that Nasheed’s administration had been elected by popular vote, but was overturned by a minority of the nation’s security forces. Former State Minister for Foreign Affairs Aslam Shakir next proposed a resolution that the MDP rally for judicial reform, which was earlier scheduled for February 17, would proceed as planned. Many party supporters are due to arrive from islands for the event. The council unanimously voted in favor of both resolutions. The council further asserted that it does not recognise yesterday’s change of government, and that Nasheed and his ministers are still the legitimate ruling body in the eyes of MDP. As the meeting drew to a close Nasheed said, “I call upon all of us to march to ‘Haruge’ [MDP camp] after this meeting and open it for it was the place where freedom of speech and expression originated.” Supporters exited the building chanting “long live Nasheed!” and made their way to the party camp. Shortly after, MDP members clashed with some opposition supporters near the Maldives Monetary Authority (MMA). MNDF forces were on their way to the scene at time of press, after the crowd had been four times pepper sprayed. Nasheed was reported to be on the protest’s front lines.